UFC octagon girl and Filipino stunner Red Dela Cruz has us ready for summer with those sizzling photos seen above! Enjoy the rest of your weekend and let Cruz be your motivation to power through next week. For more on Cruz give her a follow and shout out on Facebook, Instagram and Twitter. We are long overdue in featuring MMA knockout Lindsey Harrod! You may recognize Harrod from ring carding Invicta FC and Bellator MMA. When not working the MMA cages she is a model, blogger and a Pilates instructor. For the latest on Lindsey Harrod give her a follow and shout out on Facebook, Instagram and Twitter. Although we have shared her work on our social pages in the past we have failed to feature MMA knockout Bre Tiesi on our website until now. You may recognize Tiesi as a ring girl from Strikeforce back in the day and more recently as a Corona boxing ring girl. When you're done drooling give Bre Tiesi a follow and shout out on Facebook, Instagram and Twitter. After a tumultuous week surrounding this fight card, UFC 223 is all set and stacked with great ladies fights tonight! 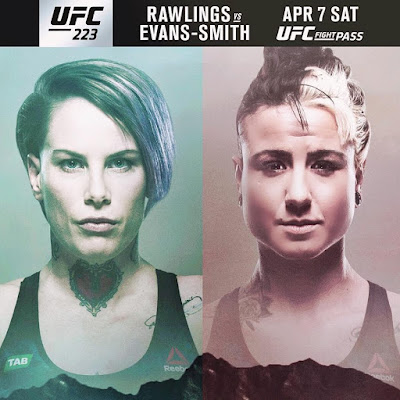 The Fox Sports 1 preliminaries starting at 8 PM ET will feature a flyweight battle between "Rowdy" Bec Rawlings (7-7) and Ashlee "Rebel Girl" Evans-Smith (5-3) followed by a strawweight match-up between Karolina Kowalkiewicz (11-2) and Felice "Lil Bulldog" Herrig (14-6). The PPV main card starting at 10 PM ET features a co-main event rematch between strawweight champion "Thug" Rose Namajunas (8-3) and Joanna Jędrzejczyk (14-1). Good luck ladies! Say hello to MMA knockout Laura Anne Harvey! This 30-year-old babe is 5’5”, 135 lbs., measures 36DD and calls Vancouver, British Columbia, Canada home. Laura might be new to the ring carding scene but no stranger to MMA fights. She first graced the cages for an AMA fight late last year and most recently for BFL MMA. Her favorite MMA fighter is Anthony “Showtime” Pettis. Outside the world of MMA Laura is a Registered Nurse in Emergency, a bikini competitor and a published model. In her spare time, you can often find her staying fit in the gym. For more on MMA knockout Lauren Anne Harvey give her a follow and shout out on Facebook and Instagram.